Ideally, comparisons between surgical procedures should be based on the long-term results of direct, head-to-head studies in which cohorts of similar patients are prospectively randomized to undergo one of the different procedures to be studied, and follow-up evaluation is conducted by practitioners blinded as to which procedure the patients have undergone. Unfortunately, it is often difficult to get patients to agree to randomization after two different procedures have been described as successful, making randomized controlled studies rare. The following studies compare the clinical outcomes of laparoscopic Burch colposuspension with those of the open Burch colposuspension, laparoscopic colpo-suspension with mesh and staples, tension-free vaginal tape suburethral sling, and bone anchor suburethral slings. For comparison purposes, the laparoscopic Burch colposuspen-sion is defined as the Burch-Tanagho colposuspension performed via laparoscopic access. There are five prospective, randomized controlled studies comparing open and laparo-scopic colposuspension in the literature. Three of these studies utilized the classic Burch-Tanagho technique, and two modified the technique by using one suture per side in most cases. All three studies utilizing the Burch-Tanagho technique have been reported in abstracts. Burton (66,67) reported a randomized controlled trial comparing open and laparoscopic Burch, utilizing absorbable suture. His study included 30 patients with moderate to severe genuine stress incontinence in each arm followed for three years postoperatively. Superior results, in terms of both subjective and objective cure, were noted in the open arm, both at one- and three-year follow-up. Objective cure, defined as no genuine stress incontinence on video cystourethrography at one year, was noted in 97% of the open cases and 73% of the laparoscopic cases. At three years, the open procedure maintained a 93% objective cure rate, while the laparoscopic cure rate had dropped to 60%. Burton has been criticized for having done only 10 laparoscopic procedures prior to the onset of the study. Subsequently, two multicenter studies demonstrated no significant differences in outcomes between the two procedures. Carey et al. (68), in a multicenter study involving 200 patients with proven genuine stress incontinence randomized to open or laparoscopic Burch colposuspension, showed six-month objective urody-namic cure rates of 80% and 69% for the two procedures, respectively, and subjective success of 95% and 100% between the two procedures, respectively. Neither difference was statistically significant. Summitt et al. (69), in a multicenter trial involving 28 laparoscopic procedures and 34 open procedures, demonstrated objective one-year success rates of 92.9% for the laparoscopic Burch and 88.2% for the open Burch. Prospective randomized studies have shown no statistically significant difference in objective cure (by urodynamic testing), with cure reported in 87.9% of the laparoscopic cases and 85% of open cases after a follow-up of 18 months. Overall, laparoscopic Burch colposuspension, when performed in an identical fashion to the open Burch, yields one-year results comparable with those of the open Burch and results in less post-operative pain, a shorter hospital stay, and a quicker return to normal activity. Long-term comparative data are still lacking. Lavin et al. (70) had cure or improvement of 71% and 91% in a laparoscopic Burch group and 67% and 89% in a open Burch group at six months. At two years, cure and improvement had fallen to 58% and 77% in the laparoscopic group and 50% and 59% in the open group. Saidi et al. (22), in a retrospective study, compared 70 patients with laparoscopic Burch to 87 patients with open Burch and reported 91% and 92% objective cure at 12 months, respectively. Prospective randomized studies in which one stitch per side was utilized have shown mixed results. Su et al. (71), utilizing two to three stitches per side for open colposuspensions but only one stitch per side on most of their laparoscopic colposus-pensions, showed objective cure rates of 80.4% and 95.6% for laparoscopic and open colposuspensions, respectively. These patients had a minimum one-year follow-up and objective cure was defined as dry on urodynamic testing. Interestingly, on a one-hour extended pad test, the laparoscopic group showed a slightly greater improvement than the open group, although there was no statistically significant difference between the groups pre- or postoperatively with respect to this measure. As previously discussed, the difference between one stitch and two per side likely accounts for the difference in outcomes. In 2001, Fatthy et al. 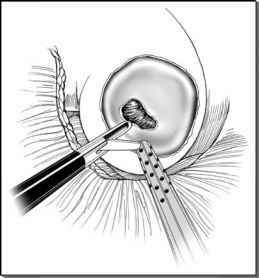 (72) published a study in which one suture per side was utilized for both the open and laparoscopic colposuspensions. Prospective randomized studies have shown no statistically significant difference in objective cure (by urodynamic testing), with cure reported in 87.9% of the laparo-scopic cases and 85% of open cases after a follow-up of 18 months. There are three published retrospective cohort studies comparing open with laparoscopic Burch, utilizing the classic Burch-Tanagho technique. Ross (8) reported one-year objective cure rates of 94% and 93%, respectively, for the laparoscopic and open approaches in a cohort study involving 30 patients followed prospectively in the laparoscopic arm compared to a retrospective evaluation of 32 in the open arm. That same year, Polascik et al. (73) reported on a retrospective cohort study, showing a subjective cure rate of 83% using the laparoscopic approach with a mean follow-up of 20.8 months versus 70% via the abdominal route with a mean follow-up of 35.6 months. More recently, Huang and Yang (74), in a retrospective cohort study, reported one-year subjective cure rates of 84% and 89% for laparoscopic and open Burch colposuspen-sions, respectively. There were no statistically significant differences in cure rates between the two approaches in any of these three studies. Miannay et al. (75) also demonstrated no difference in subjective cure rates at one and two-year follow-up between open and laparoscopic colposuspension, even though only one suture per side was utilized in the laparoscopic cases. Laparoscopic Burch studies report the following advantages: a shorter length of stay with the laparoscopic approach was noted in all but one study in which this parameter was studied (3,5-7,9,11,12,74). Likewise, significantly less postoperative pain (5-7,12) and a quicker return to normal activity were noted in the laparoscopic group (5,7,11,12). When reported, complications did not differ statistically. The data from these studies are, for the most part, consistent with prior noncomparative studies of laparo-scopic Burch colposuspension. It has been almost a decade since Ulmsten et al. (76) described the tension-free vaginal tape suburethral sling procedure and reported on his early successes. The rapid rise in popularity of the tension-free vaginal tape procedure has coincided with the rise in popularity of the laparoscopic Burch colposuspension as minimally invasive procedures for the cure of genuine stress urinary incontinence. Both procedures have their cadre of proponents, with laparoscopic Burch colposuspension advocates noting the longer track record of the Burch procedure, the ability to visualize the surgical field, and the lack of concern over erosion, while tension-free vaginal tape advocates point to shorter duration of surgery, slightly shorter recovery, relative ease of the procedure, and perceived lower cost. To date, there have been two prospective, randomized controlled trials published comparing the two procedures and one large prospective randomized controlled trial comparing tension-free vaginal tape with the open Burch procedure. Persson et al. (77) reported one-year follow-up data on their prospective randomized trial comparing tension-free vaginal tape with laparoscopic Burch colposuspen-sion. Their study, assessing 31 patients in the laparoscopic arm and 37 patients in the tension-free vaginal tape arm, demonstrated no significant difference in efficacy between the two procedures, with objective cure rates (defined as a negative short pad test) of 87% and 89%, respectively, for the laparoscopic Burch and tension-free vaginal tape. Interestingly, subjective cure rates were markedly lower in both groups, 52% and 57%, respectively. These findings were based on a strict questionnaire and there was no significant difference between the two. Ustun et al. (78) reported a study of 46 patients with genuine stress incontinence randomized to undergo laparoscopic Burch (n = 23) or tension-free vaginal tape (n = 23) who were followed for up to 24 months postoper-atively. They showed an objective cure rate of 82.6% in both groups. The laparoscopic Burch group had a mean follow-up of 13.5 months, and the tension-free vaginal tape group with 11.3 months. Cure was defined as subjectively dry, negative stress test, and no leakage on urodynamic testing performed at three months. Ward and Hilton (79) recently published two-year data on their ongoing prospective randomized controlled trial comparing tension-free vaginal tape with open Burch colposuspension. The two-year follow-up data for objective cure by negative pad test was not statistically different between the two procedures, with 81% of tension-free vaginal tape patients and 80% of open Burch patients cured. Sixty-two percent of the patients with the open Burch procedure and 60% of tension-free vaginal tape patients reported being dry in this study. These findings are in agreement with other studies comparing these procedures. There are few studies with direct comparisons of complication rates, costs, length of stay, and perioperative convalescence between laparoscopic colposuspension and tension-free vaginal tape. In Persson and Wolner-Hanssen's study (47), the authors noted a statistically shorter operating time and fewer postoperative visits in the tensionfree vaginal tape group. There was also a trend toward earlier discharge in the tensionfree vaginal tape group. Ustun et al. (78) reported shorter operating room time and length of stay in the tension-free vaginal tape group. These data are, for the most part, consistent with noncomparative data on tension-free vaginal tape, which generally show operating time shorter than that reported in most studies for laparoscopic Burch. In general, the more experienced the laparoscopist, the smaller the difference in time between the two procedures. Despite the shorter operating room time, Persson and Wolner-Hanssen (47) found the total cost of tension-free vaginal tape to be higher than that of the laparoscopic Burch, because of the high cost of the tension-free vaginal tape set. Cost comparisons are notoriously difficult not only because of differences in surgery times among different surgeons but also because operating roomtime costs per minute differ among different locations. There are no studies with direct comparisons of intraoperative and postoperative complications. In a prospective randomized study comparing immediate outcomes of tensionfree vaginal tape and laparoscopic mesh colposuspension, Valpas et al. noted no major differences in intraoperative or postoperative complications. Likewise, Debodinance et al. (81), in a retrospective review of all 800 female anti-incontinence procedures performed at their hospital over 13 years, showed no major differences in intraoperative or immediate postoperative complications between tension-free vaginal tape and laparoscopic Burch colposuspension. He did note higher de novo voiding difficulties (18.5% vs. 0%) and de novo urgency (11% vs. 4.8%) in tension-free vaginal tape when compared to laparoscopic Burch colposuspension. Valpas et al. (80) demonstrated a shorter duration to complete bladder emptying and reduced pain medication consumption in the tension-free vaginal tape group. In addition to tension-free vaginal tape, transvaginal bone-anchored sling procedures have been introduced in an attempt to provide a minimally invasive sling for the treatment of female genuine stress incontinence. There are no long-term follow-up studies beyond 36 months for bone-anchored slings and no comparative studies. There is no prospective data or objective outcomes analysis. Studies reporting on bone-anchored slings utilizing cadaveric fascia for the sling component demonstrate cure rates ranging from 37% to 78%, with mean follow-ups of 10.6 and 30 months (82-84). Suspected failure of the cadaveric material is the given for the poor results. The best results are a 78% subjective cure rate with a mean follow-up of 12.4 months, obtained utilizing Tutoplast cadaveric fascia lata. Complication rates were low, though de novo urge incontinence was noted in 58% of patients in one study (83). Three studies utilized coated polyester for the sling component. Cure rates were 61.5% at a mean follow-up of 11.4 months (85) to 90% with a minimum follow-up of 24 months (86). The latter study excluded patients with ISD. Giberti and Rovida (87) reported a 100% failure rate with four patients with intrensic sphenteric deficiency. Erosion and impaired wound healing were a significant problem in two of these studies, affecting 16% (87) and 53.8% of patients (85). Rates of de novo urgency and/or voiding dysfunction ranged from 8.6% (85,86). With the lack of comparative trials, evidence from the current literature on transvaginal bone-anchored sling would indicate that it offers no advantage over laparoscopic Burch, in terms of efficacy, and may produce inferior results. Additionally, the studies suggest a higher complication rate. Comparative studies are necessary to make any further clinical assessment of transvaginal bone-anchored sling procedures.